With the arrival of Easter on Sunday, today’s post will mark the end of the series of seafood dishes. And what a good one to end with: Broiled Halibut! Some may be surprised to learn that halibut is what’s called a “flatfish”, meaning that it has evolved into one that lives on the ocean floor. Think flounder or sole, only very much larger. Like most flatfish, at birth halibut fry appear and swim like the young of other fish. Around 6 months of age, however, one of its eyes begins to migrate to the other side of the fish. As it does, the fish goes from being left and right-sided to having a top and bottom-side. The top-side (the side with both eyes) develops a gray color while the bottom-side (the side that rests on the ocean floor) becomes white. As is so often the case with seafood today, halibut is in trouble in some areas. Look for Alaskan, wild caught, and do not buy Pacific halibut caught with gill nets nor Atlantic halibut caught through bottom trawling. If your fishmonger doesn’t know how or where his halibut is caught, it’s a sign to buy seafood that you know to be sustainable. My experience has been that fishmongers are proud to tell you when their stock is sustainable and harvested correctly. Halibut flesh is not oily, as was the swordfish of a few weeks ago. The flesh is every bit as firm as was the swordfish and stands up to grilling very well. And if a fish fillet works well on the grill, it will do very well under the broiler, too. Halibut has a good, clean taste that I very much like. As such, I prefer not to do anything to prepare it — no marinades, for example — other than salt, pepper, and olive oil. When preparing the mushroom accompaniment, I chose 2 that were delicately flavored and shiitake, which has a bit of a smoky taste. The idea is for the flavors to co-exist and not for any one to obliterate the others. Broiling is a wonderful way to prepare meats and seafood, though one should probably learn how to use one’s broiler with something other than an expensive halibut fillet. When I broil a fish fillet, I’ll use a baking sheet covered in aluminum foil that has been lightly coated with olive oil or butter, depending upon the recipe. My oven’s first rack’s setting is about 5 inches beneath the heat source, perfect for broiling fish. Remember that the distance away from the heating element and thickness of the fillet(s) will affect cooking times, so, be sure to keep an eye on any kind of fish you put under your broiler. I’ve included more guidelines for broiling within the recipe, as well as how to test your fillet(s) for doneness. Clean and slice the mushrooms (see Notes), chop the herbs & shallots. Heat the oil in a large frying pan over med-high heat. Add the shallots and sauté until they soften, about a minute. Add the mushrooms, lower the heat to medium, and continue sautéing for another 7 or 8 minutes, stirring often. Mushrooms will be ready when they have given up their liquids and darkened in color. Add the wine, increase the heat to med-high, and sauté until wine has all but evaporated. Add the herbs and stir to combine. 1 minute later, remove from heat, add parsley, stir throughly, and serve. Lightly brush the fillet(s) with olive oil. Season with salt & pepper. Place fillet on a lightly greased baking sheet and set aside. Pre-heat broiler for 15 minutes. Place an oven rack about 5 inches from the heat source. Place fillet(s) directly under the heat source and broil from 7 to 9 minutes. If more than 1 fillet is being broiled, turn the baking sheet midway through the broiling. To test if this or any fish is cooked: use a metal skewer or sharp knife to pierce the fillet at its thickest point. Keep it there for several seconds. Remove it and use it to touch the inside of your wrist or the area beneath your lips. If cold, the fish isn’t cooked. If warm, the fish is cooked rare. If hot, the fish is done. If very hot, the fish is over-done. Serve immediately, using the mushrooms as an accompaniment. These mushrooms can be served with any number of dishes. I use white wine when serving mushrooms with seafood, pork, and poultry, but red wine for beef and then I’ll use crimini mushrooms rather than the more delicate tasting funghi. And though I don’t use garlic when serving this with seafood, I will add it for other dishes. You can easily alter this recipe to suit your own tastes. Do not use water to clean these mushrooms. Use a damp paper or kitchen towel to gently wipe them. The stems of Shiitake are tough and inedible. They should be cut off. The same may be said of the base of Maitake mushrooms. 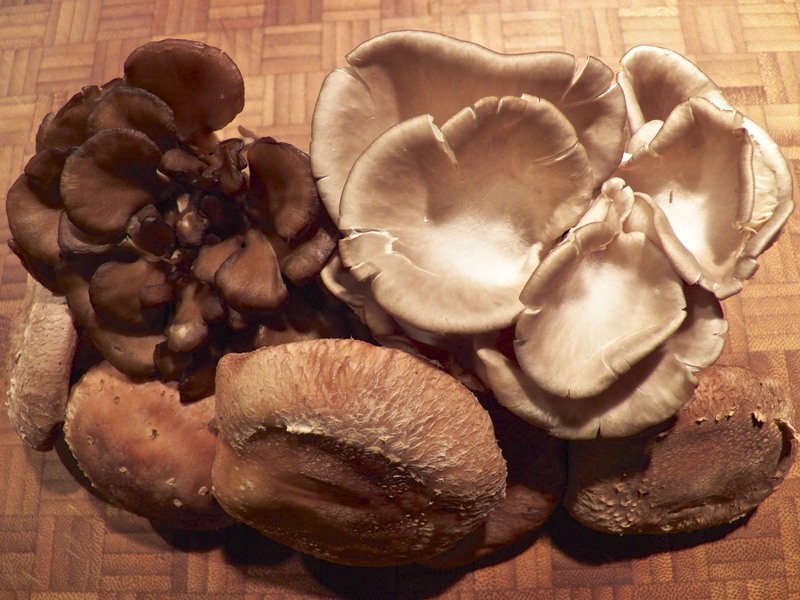 Some believe the base of Oyster mushrooms to be edible. I find them to be a little tough and trim them away, as well. Earlier I mentioned that you should save the mushroom bits and pieces. Why toss them when you can easily use them to make stock? Once I trimmed and sliced the mushrooms used in today’s recipe, I was left with about 4 oz (114 g) of stems and woody parts. These were roughly chopped and placed into a medium saucepan, along with an onion, a celery stalk, a carrot, a couple of parsley stems, a sprig of thyme, and a bay leaf but no salt nor pepper. I added a quart of water, brought it to a boil, and then reduced it to a simmer. Since I had relatively few stems, I wanted to concentrate the flavors, so, I left the cover off of the sauce pan while it simmered and reduced. Had there been more mushroom parts, I would have covered the pan for there would not have been as great a need to reduce the stock. In any event, after an hour, I had 12 oz (355 ml) of stock headed for the freezer. I’ll use it the next time I make risotto, soup, a gravy or sauce. And there’ll be no need to worry about its salt content ruining my dish. If leftover, mushrooms cooked like this are worth their weight in gold. Use them for an omelet the next morning or to top off your burger for lunch. Yes, you can always use them to accompany your next supper’s protein but — and perhaps best of all — you could reheat them with a little more oil and some red pepper flakes. Add your favorite pasta and you’ve got a fantastic dinner, ready in minutes. Easter is right around the corner and today’s Blast from the Past features a dish that graced our table any number of Fridays, both in and out of Lent. 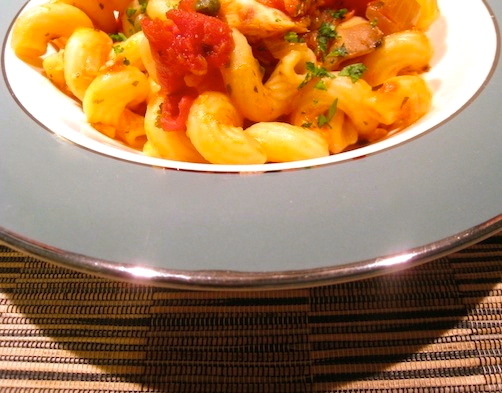 Our Tomato Sauce with Tuna is a simple tomato sauce with tuna as its protein. It’s easy enough to prepare and doesn’t require a long simmer, unlike its meaty cousins. If you’re at all curious, you can see the recipe by clicking HERE. This looks outstanding John! I love mushrooms, especially fresh shiitake and oyster. 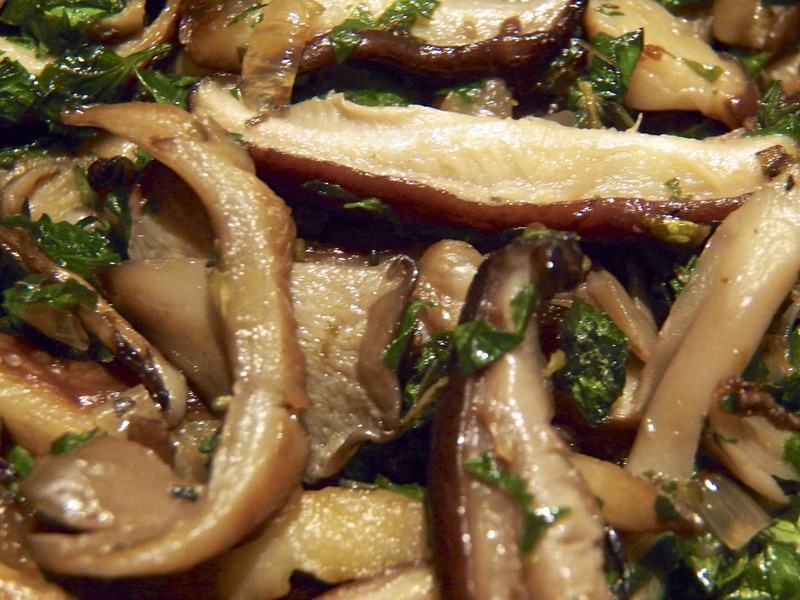 What a great combination of flavors you have here.. wine, mushrooms, fresh herbs –delish! Thank you, Anne. If you make these mushrooms, make plenty. They really can be used in any number of ways on Day 2 or 3. Heilbut is a very delicate fish….and the Way you make it ..its delicious!!!! Thank you so much. I’m glad you like the post. Thanks, EllaDee for the complement and Easter wishes. I hope your Easter and get-away are both fantastic. Grilled fish on Friday is a great idea, as is a seafood dinner for Easter. That’s my kind of menu! Thanks, kind Sir . . . I went to bed after a long, long work day with a damnably sore knee and ticked myself off unceremoniusly for again allowing my ‘peculiar sense of humour’ to show 🙂 !!! Happy Easter, John !!! I hope you have a wonderful Easter, Eha. Stay off that leg and give your knee a rest. You are most welcome! There are more to come but they’ll have to wait a bit. There you go again. A beautiful combination, beautifully presented. I am looking forward to your ham post too. I have Limerick Ham appearing tomorrow, just in time for Easter. I hope you like it. Thanks, Conor. I look forward to seeing how you prepare your Limerick Ham. I bet it it’s delicious! I´ve never thought to combine mushrooms with fish – but, to be honest, I have no reason for this. I guess I´ve just associated mushrooms more with chicken, pork or beef. Silly me! Thank you, Marianne. Fish and mushrooms isn’t a common pairing but they go very well together here, probably because the halibut isn’t a strongly flavored fish. Although I’ve none now, I’ve had fresh and marine tanks much of my life. Flatfish and their roving eye have always fascinated me. You’re right, though. Glad it ain’t me! Hope you and yours have a wonderful Easter! Outstanding post, John! Fresh halibut is hard to find in these parts, probably because the areas where it is still being caught are far away. I’ll look for it, because I’ve never prepared it sous-vide and wonder what that’d be like. Broiling sounds like a good idea as well, but I have a crappy broiler or I should get to learn it a bit better. Love the mushrooms and especially the mushroom stock! It is okay (and a lot more easy!) to use a bit of water to clean mushrooms, by the way. This has been verified by Harold McGee, and it beats cleaning with a wet cloth. Finally, I’ll have to do more with pairing mushrooms with fish. Thanks for the inspiration! Thank you so much, Stefan, for leaving such a nice compliment. Halibut flesh is firm, good for broiling or grilling. I bet it would be wonderful cooked sous-vide. Although available here, halibut is by no means inexpensive. With the exception of today’s post, I only prepare it now on special occasions. That’s fine, especially if the decreased demand means that halibut will stay off the endangered lists. Great tips for sustainably sourcing of halibut, it’s a fine robust fish that is an occasional treat for me. Love the idea of broiling and serving with these pretty and delicate fungi, a new idea for me. Thanks John, for another fine recipe and tips! Again… it’s to bad that a fish like halibut, which was so plentiful when I grew up, is now so scarce as to be rare. Question – what is “sous-vide”… I lived in the province of Quebec for many years.. but I don’t know what that means… Literally, it seems to mean “under-empty”!! Sous-vide is a style of cooking in which the food is sealed in an airtight bag and submerged in hot water for a rather lengthy period of time. The temperature of the water can be from 130˚ to 140 ˚F (55˚ – 60˚C). If you wish to see a recipe, check out my blogging buddy, Stefan. He just shared a recipe for coq au vin, cooked sous-vide. You can see it here: http://stefangourmet.com/ It’s interesting, to say the least. Ding, ding, ding! Thank you! Do you realize how much self-control it took me, of all people, to write a post about halibut and edit it, again and again, and never insert that term? If you hadn’t wrote it I may have exploded. John… this is in response to your “Just for the halibut” comment… As I said earlier, how did I ever live without you??!! Thank you, Tanya. With all of the mushrooms you guys collect on The Mountain, you could throw together some wonderful combinations, suitable for just about any dish/protein. As I’ve said in the past, this blog is meant to inspire the young cooks in my family. So far, I’ve showed them how to pan fry, grill, and now broil fillets. I’ve still got a baked recipe and a salad or two to show them. Only by doing will we get over our fear of cooking fish. I know. I went years without cooking it because I was sure I couldn’t. I hope you, Big Man, and your families have a wonderful Easter, Tanya. Oh wow this looks incredible ! I’ve never thought to combine fish and mushrooms but I can only imagine the results are mind blowing! Such mouthwatering photos too! Thank you so much, Sam. I really do appreciate your compliments. Ahhh a great recipe John! I was eyeing up some wild Halibut filets the other day but for some reason plumped for Skate wings. Maybe on my trip to the fish market tomorrow I’ll be tempted! It’s a delicious fish, delicate in flavour. Believe me, I was very happy there were some beautiful halibut fillets, properly caught, at the fishmonger the afternoon I went looking for today’s fish. What luck! And that cocktail was just to see who’s paying attention. You, my dear, are the first and may come to the head of the class. I’ve never paired mushrooms and fish but this recipe sounds and looks delicious! Made my mouth water. Thanks, April, and this is one dish that you can fix with absolutely no fear of encountering a bit of dairy or gluten. That’s a rarity around this blog and I’m so glad to oblige! What a lovely recipe. I seldom cook fish, but this would be my first choice! Thanks, Michelle. This is a mild tasting fish and would be a good one to prepare. Thanks for the tip on how to clean the mushrooms. I have really enjoyed your fish series but I have got to say that you have my attention with your “teaser” on the next post. 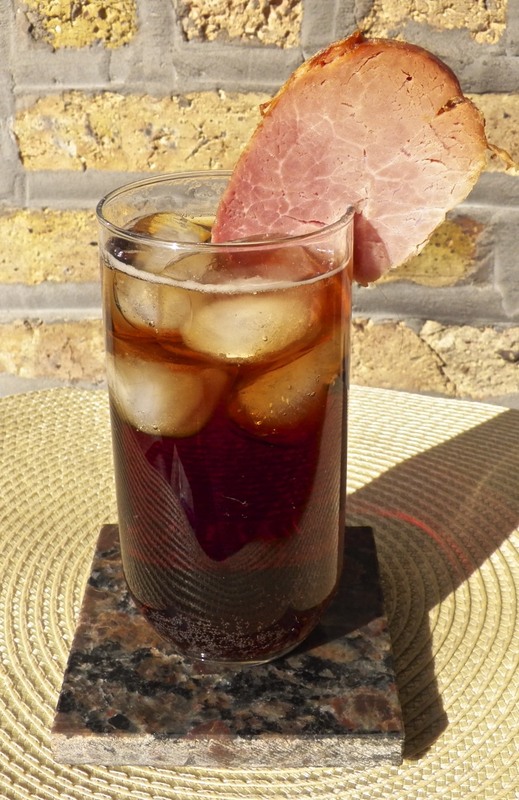 Your first way to prepare bourbon and coke soused ham is certainly “original”! Yea! Another substitute for lemon wedges in drinks. Wait till you see what I’ve got planned for Manhattans. I’ll be mixing up a batch my next visit. Apropos to nothing, you do like liver, don’t you? Thanks, Sally. Yes, you’re life is in a state of flux but it won’t remain that way. Just imagine how good that first seafood dinner will be when you prepare it for yourself at home! I bet it will be fantastic! And don’t hold back. Make it a dinner you’ll remember! Halibut is such a great fish, Ken, that just a simple sauté will allow it to shine. I didn’t want to sound preachy about sustainability week after week but it is important. I want to do my part to ensure that the grandchildren of today’s newlyweds have the same selection of seafood, if not better, that we do. We just need to inform ourselves. Absolutely phenomenal, John! I love halibut to start with, but your recipe redefines what a great halbut dish should be all about. I love it when you said that, given the clean taste of the halibut, you did not want to do anything to prep it: I really appreciate it as this brings back memories of how most fish is done in Italy, very simple not to alter its natural flavor and let it speak for itself. That’s the way I like it (to quote the famous song!) – certainly to do that you need a top quality, super fresh fish! Thank you, Stefano, for the nice compliment. Mom & Zia did not have a wide variety of spices and herbs. They had some for baking, to be sure, but for most dishes, they relied on olive oil, parsley, garlic, rosemary, and sometime marjoram. There were exceptions, of course, but for the most part everything was seasoned simply. It took me a long time to realize that when the ingredients are “top quality”, as you say, less is more. I totally agree, John – and by the way I love marjoram, such a nicely flavored herb! Happy Easter, John! Thanks for this great fish series (and the story about halibut). I love the mushroom/halibut combination. 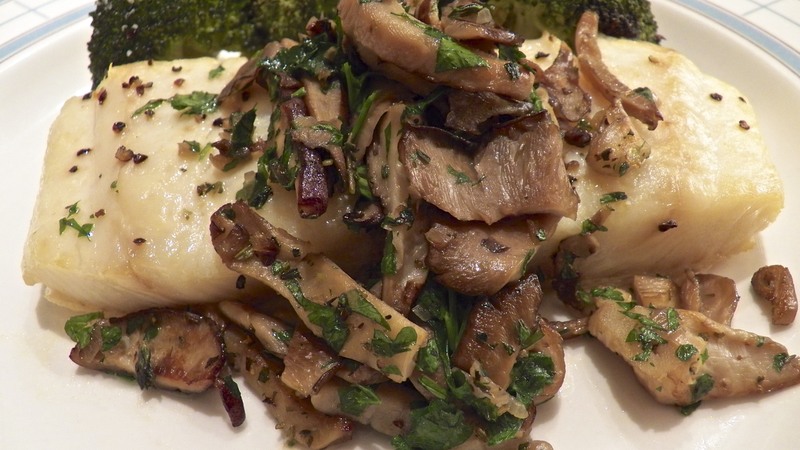 Mushrooms aren’t commonly used with fish, but your recipe, with the wine and herbs, would make it a great mix…. This dish looks delish! I love mushrooms, but don’t think I’ve ever served them with fish … I will have to try it. I agree, the mushrooms could be served with so many dishes–YUM! I was just at the store yesterday lamenting the price of halibut, it is one of my favorites and it’s been ages since we’ve had it. Thank you, Judy. I, too, love halibut but it is getting far too expensive. Now it is a celebratory meal entrée and that’s a shame. I hope that “they” can figure out a good, eco-friendly way to farm raise them. If not, I just won’t be serving it. Thanks MD. Having that little bit of stock in the freezer really does come in handy when risotto is on the menu. Great dish! I love halibut, and have never met anyone (except for the most confirmed fish hater) who didn’t. Because it’s meaty but with a mild flavor, it’s always a great choice for those who often shy away from fish. Love the mushrooms, too! They look so great, and that’s a nice, quick stock you made with the stems and such. Excellent recipe and post! And you have me sold on next week’s recipe already – who can resist a ham garnish? Brilliant! Lovely recipe as always. My comment has to be what is coming to me soon!! I had to go and get my glasses just to confirm that was indeed a piece of ham perched on the side of a glass of bourbon and coke. It made me laugh out loud and has me itching for your forthcoming ham recipe!! Happy Easter. Thank you, Maria, and I’m glad you enjoyed the joke. I hope you and your family have a wonderful Easter. Great minds, we just had tilapia with a mushroom and tomato Mediterranean style sauce — it was incredibly good. My mushrooms weren’t nearly as exotic but the idea was similar! I wish I had written down the recipe because I would definitely eat it again! And I’m absolutely loving the idea of making the mushroom stock, John; I usually make mushroom stock out of the dried mushrooms’ soaking liquid, it works incredibly well in risotto (or barley risotto which is what I usually make). I must say that piece of meat in that cocktail made me do a double take, WHAAAA? Meat in a cocktail? It’s genius really. It gives me a few ideas…. Hope you have a great weekend, we’re off for a few days and I am unsure if I will have internet access. Thank you, Eva. There’s a new chain of groceries opening here and they’ve a rather extensive stock of mushrooms, most of which I’ve only had dried. It’s been great getting “the real thing” for a change, especially with a pricey cut like halibut. The upcoming ham recipe relies on a healthy dose of bourbon. So, I thought, why not have a cocktail with a healthy dose of ham? I’m glad you enjoyed it. Hope you’re having a wonderful weekend with weather to match. That sounds like my kind of grocery store, John. If we plan a visit to Chicago, may I trouble you for a list (or even better, a tour) if you aren’t too busy? Our weather is much more spring-like, finally. My crocus have bloomed and the garden has that lovely wet scent that happens when things start to defrost. Hopefully tomorrow will be warm enough to have a quick cocktail outside! Eva, when you come to Chicago next, if you can spare me a couple hours, I can take you to the Italian market, in Elmwood Park and then, on the way back, is the new grocery and, right down the street, the sustainable fish market. Of course, we needn’t do them all but, if you really feel like it, we can head over to my area. Once here, we can make a stop at Patel’s in Little India for spices and then over to Little Chinatown for Asian supplies at the Vietnamese market — or any number of Asian markets in this area. And if you’ve still not found what you’re looking for, we’ll head to the Middle Eastern bakery for more spices. You’ll head home feeling like Marco Polo! We may have reached 60˚ (15˚C) with sunny skies today!!! Rain is coming tonight but that’s ok. We finally had a touch of Spring. Only about 25% of my crocus have bloomed but that’s ok. If the rain tonight is heavy, it would only ruin them. Colder weather returns to start the week but we had a fantastic day today. YAY! Wow! That would be incredible John, thank you! I think the crazy squirrels ate must of my bulbs, I planted over a hundred last fall and see only about five crocuses. Also I’m putting my boots away in protest of the chilly weather; I’m done with winter. Not to worry, Eva. We’ll do as much as you’ve time for. A couple years ago, the squirrels devastated my newly planted bulbs and iris, too. We’ve come to an agreement. I don’t plant any more and they don’t touch what’s already in the ground. It’s an uneasy truce but it is working. I love the simple preparation and the list of ingredients: easy and accessible! And using the mushrooms in my pasta the next day is a bonus! I learned quite a bit about halibut here. And I’m happy to know what KIND to purchase, I always have the moment of self doubt when I buy fish. John, what is the ham doing on your bourbon and coke? Honestly I’ve never seen that! Not that I’d turn it away or anything!!! Bourbon and ham pair well together after all. Thank you so much, Tanya. I have an app on my smartphone that will tell me what is sustainable and suggest alternatives but I’m still sometimes unsure. For me, it’s been a blessing geting to know my fishmonger. I have to trust what he tells me. This is the best I can do, short of getting on a boat and fishing for my supper. The ham cocktail was just a joke. As you’ll see, my ham is drenched in bourbon. Why not have a bourbon cocktail with a bit of ham? Thank you, Debra. I’m so glad you enjoyed this post and found it helpful. None of the methods or recipes within this fish series are that difficult to duplicate. I know that the cost of fish today makes everyone leery of experimenting. But, you needn’t experiment with the most costly. Salmon can be pan-seared or grilled. Cod can be baked or broiled relatively easily and doing so will give you the experience — and confidence — you need to tackle one of its more expensive cousins. It really is a case of practice makes perfect. I’ll be sure to send your Easter greetings to Zia and hope that you and yours have a fantastic Easter! The fish looks wonderful once again! Thank you for the idea to use the mushroom stems for making stock. I had not thought of that before. We usually have an abundance of mushrooms in the fall when we make regular mushroom picking excursions. Thank you. how I envy you your mushroom harvests in the Fall. It must be wonderful. I hope you and your family have a wonderful Easter! Great combo, halibut and exotic (and pricey) mushrooms. I see you chose ground white pepper instead of black, is that for appearance? Looking forward to learning about the ham sitting on the glass. Thanks, Geni, for the encouraging words. If we inform ourselves, many of the fish currently endangered can rebound. There have been success stories. North Atlantic cod, for example, has rebounded. I don’t mind paying a little extra if I know that, by doing so, I’m helping to ensure the grandchildren of today’s newlyweds will be enjoying the same fish. 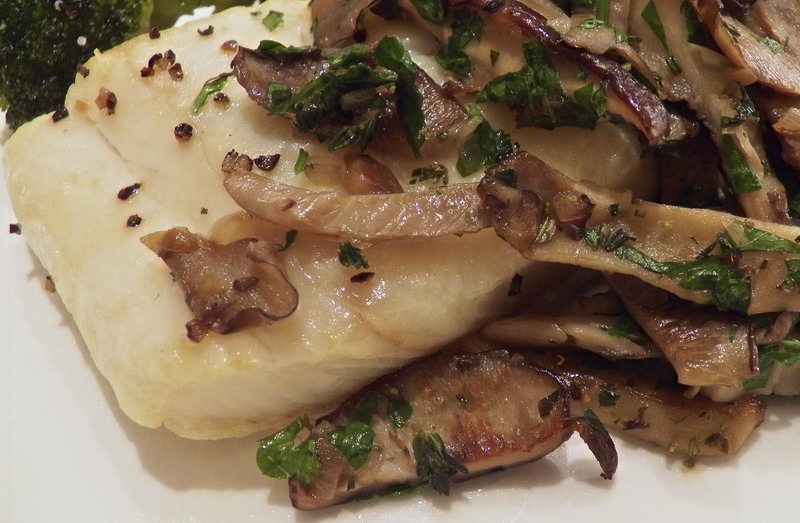 Mmm halibut and mushrooms–great combo. Looks fantastic! and what is that drink?!!! I need it. I’ll keep my eyes out for the post. 🙂 Happy early Easter to you! What a great dish! I can’t wait to try it. One good thing about Lent is the increased number of fish dishes in the blogosphere. Happy Easter! I hope you and yours have a happy Easter, too. The flavours look incredible John!! I love every ingredient in this dish, and mushrooms always make my day. Love the post!. Thank you so much, Minnie. I’m glad that you enjoyed the post. Halibut is one of my favorites and mushrooms are the other. But where have I been? Making mushroom stock is a must do the next time I buy them. Happy Easter! Thanks, Abbe. Even if you only get a half-cup of stock, it will still be a great addition to gravies or risotto. And it’s such an easy thing to make and store. I hope you do try it. Wonderful post, John. I’m sure the halibut and mushrooms paired beautifully. I agree with you about saving the stems from the mushrooms. We do it ll of the time. We have a bag we keep in the freezer just for mushroom stems. They make a wonderful liquor (broth) that we add to soups, sauces, mushroom caps served on the side, etc. Thanks, Richard, for always being so encouraging. I almost didn’t add the portion about making stock with the stems. It’s just something that’s always been done. Judging by the response, though, I’m glad I did. Oooh, Halibut! One of my favorites! I swear, Marie, you should write a book about your experiences behind the counter. Anyone who has ever served the public would buy it, no doubt about it. I’m glad you enjoyed the post and hope you and your family have a wonderful Easter. Your mushroom recipe sounds delicious. I haven’t been very adventurous in the mushroom department, I’m afraid to say; it appears I need to get out and about a little more and get acquainted with different varieties! I have to say, your picture of a mixed drink garnished with a slice of ham made me laugh out loud. No celery sticks here! If you’re not familiar with mushrooms, Mar, this preparation is a good way to experiment. None of the flavors are so strong that the mushrooms cannot be tasted. If you’re still leery, don’t use all 3 just use 1 or 2. With your skill in the kitchen, I can’t wait to see how you’ll use them. Thanks for the tips, John. One of the unexpected benefits of food blogging is that I have a growing list of things to try! I love that you reminded people to NOT wash off their mushrooms. So many people do just that. And, I’ve gotta tell you… I totally cracked up laughing at your photo for the “Bourbon and Coke Soused Ham”!! You are just tooo much!! Thanks, Cecile. i don’t think everyone realizes that many mushrooms are hydroponically grown now. Washing them is a waste of time. I’m glad you enjoyed the cocktail. I hope you’ll like the ham recipe as much! Cecilia (our names are almost alike!!) – I enjoyed reading what you wrote. I don’t understand why trawling with weighted nets is even allowed. As you know, it destroys EVERYTHING in its path. Although I do eat fish I could not agree more with you and I do believe an ever increasing number of buyers, Down Under at least, ARE asking questions! I have seen the practices on film and am highly disturbed by them also . . .
No need to apologize, Celi, especially here and about the subject. If we do not wise-up, our grandchildren will have few fish to eat. We must demand eco-friendly harvesting. We did it with dolphin-free tuna and recently Target stopped selling farm-raised salmon. We have to hit the unscrupulous ones in the pocketbook and refuse to buy their catch, pure and simple. I love halibut, and so rarely see it around here these days. I’ve never tried broiling fish…always grilled or baked, but am intrigued. 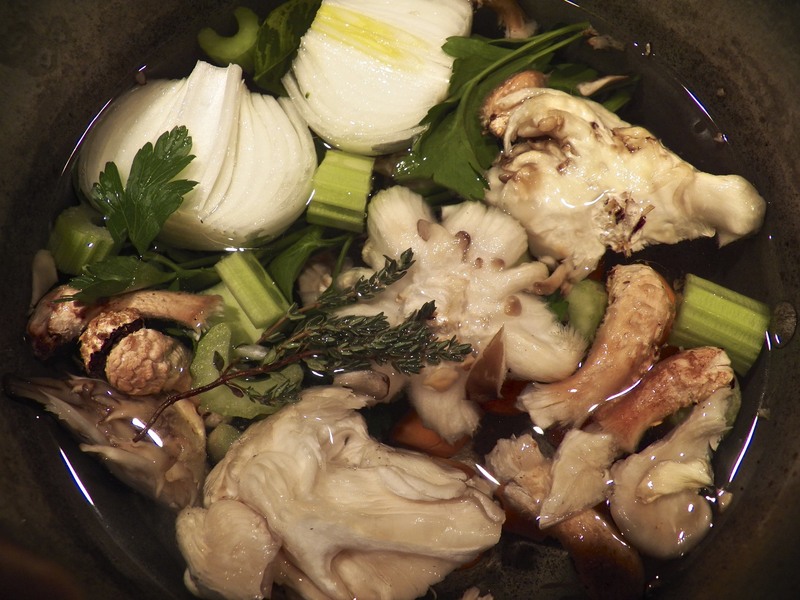 Love your flavors with the mushrooms, and the great advice about making stock with the stems. This sounds like a fantastic dish to make on a weeknight, so simply but perfectly flavored. And bourbon and coke ham…what fun! Can’t wait for that one. 🙂 Happy Easter, John! You are so right. You really don’t see it very much anymore – esp. on restaurant menus.. Thanks, Betsy. For me, the real beauty of this dish is how simple and quick it is to prepare. Like you say, it is a good weeknight dinner but, being halibut, it makes it special. Glad you enjoyed my cocktail. Cheers & Happy Easter! That’s about the cost here, too, Betsy. It’s now a meal for special occasions. I don’t mind so much if it means that halibut will be around for the foreseeable future. I love halibut, and believe it or not, but have not had it since we moved from Washington state, which is in three years (almost). I want to be at your dinner table for a bite of this dish! You are wrapping up the seafood series with a spectacular recipe offering. I’ve shared it on Facebook cause everyone should see your wonderful blog posts. You set a high standard. Wishing you a Happy Easter, John. I hope you and your lovely family have a wonderful Easter, Ruth. Why does the Italian name sound so much better than in english? Love the broth idea. And don’t forget, once you use those veggies, you can compost them! Halibut was a Friday night fixture at our place as it was for most of the people in Maine. None looked this good though! Thank you, Maureen. What a kind thing to say. I hope you and your family have a wonderful Easter. Such an easy but really great sounding meal. Our market has a sustainable seafood policy which I think is a great move. I may not always be able to get the fish that I was looking for but at least I know that they have done their part to help in this area. Oh do I love the look of that combination of mushrooms (but I’ll have to admit, I just have to rinse my mushrooms – can’t help myself). Thanks, Diane. We’ere total agreement about buying fish. I go to the fishmonger wanting to buy something but will readily change my mind depending upon what is available and how it was harvested. Ah, that makes all the difference – mine are usually covered in lots of mud (I think). I don’t think I’ve seen any that are hydroponically grown – I would love that. you’ve doing it in a correct way phal….. Yes, it is expensive here, too. i cook if on special occasions only now. I’m glad you like how I prepared it. Thank you. This looks lovely, toothy halibut with meaty mushrooms. Yum. Will have to snag one of the halibut fillets next time they pop up at the fishmonger. Thanks for sharing! That’s very kind of your to say, Charlie, and I really do appreciate your words. I don’t know whether fresh halibut is available in “your neck of the woods” but I hope so. It is such a great bit of seafood. I hope you and your family have a wonderful Easter, Charlie. Any fish monger or butcher should be proud to tell you where there stock originates from. Sadly I’ve often heard the “wrong” words coming out of their mouths. Like In Wyoming I asked a butcher where they sourced their meat from and they said slaughterhouses in Iowa/Nebraska(!). Nothing grass feed/organic from WY?? Nope that is real difficult to come by. Ha! Anyways love the idea of broiling the halibut and of course the collection of fungi spoke to my gluttonous heart…til I saw that drink which nearly made me jump into the computer screen. TImes sure have changed, Jed. When Wyoming doesn’t have grass fed cattle, we’ve really lost our way. I have a hard time looking at a fish counter and seeing fillets of fish that I know to be in trouble. What are we doing? Hands down, this is my favorite whitefish and I am loving the preparation because you give it its lightness of being. And the mushrooms beautifully prepared – just highlight it. Thank you for your compliments. Yes, halibut is a favorite of mine, too. I like your halibut…I could see it sitting on top of a nice bed of buttery mashed potatoes. I love the idea of your serving suggestion, Karen. Thank you! Another gorgeous fish recipe to arrive home to………I enjoyed a herb crusted fish while on holiday and thought this is a dish our John would make. So pleased you have some sun at last. Home already? That went by fast. Your herb crusted fish sounds wonderful, Elaine. I certainly would have ordered it had I been there. Welcome home and I hope you and yours have a wonderful Easter. John, your “broiling tips” are great. The ovens in the United States are much more complicated than in Italy and I have to admit that I struggle a little bit with the broil function. Yesterday I cooked salmon for Stefano. As you know, fish is not my thing. Well, I used the broil function and…the fish was cooked only on the top (inside was completely raw). I’ll try again and I’ll follow your directions. Francesca – And I had trouble using my appliances – including the oven – when I lived in the tiny island country of Malta. Of course, the temperature was in Celsius – so I had both the Celsius and Farenheit temps. written down and pasted inside a cupboard. Both my refrigerator and stove were really small. In fact, I burned myself more than once getting things out of the oven – and I still have the scars to prove it!! Yes, no matter what boiler I’ve ever had, it took a few uses to learn its “temperament”. I’ve burned a few dishes — and set a couple on fire — learning how to use them. Even now, I stay next to the stove when there’s something under the broiler. Wishing you, Stefano, and all whom you hold dear a wonderful Easter, Francesca. Buona Pasqua! I had no idea how big halibut could get until one year when we were in Alaska I walked by a pickup truck and the entire bed was covered with ONE halibut! It was HUGE! Aside from salmon, halibut is my favorite fish and I’m always looking for new recipes for it. We can actually get it here in the high desert once in a while, so I’m looking forward to giving your recipe a try. I love mushrooms and I can’t imagine that this combination of flavors and textures wouldn’t be fantastic! Thank you so much, MJ. I’ve never seen a really large one but have heard they can be quite large. That one you saw must have been something to see! Halibut is a favorite of mine, too, but it’s really getting expensive now. Well, if the price keeps them off of the endangered list, I really don’t mind. Rather that than it be inexpensive and then gone forever. Thanks for the broiling tips. Honestly, I never thought to pair fish and mushrooms. I think this would be really tasty! You’re very welcome. Give this pairing a try. I do think you’ll like it. The Halibut looks great John, but those mushrooms look divine! Buona Pasqua! Thank you so much, Lidia Buona Pasqua! As you might remember, I lived for a while in the tiny island country of Malta. One of my good friends from there moved to Austalia, and she posted a photo of a beautiful Easter table which was decorated by her “zia”… I asked her if “zia” meant “aunt”… and learned that it does. Do you always call your aunt “zia”? What is her actual name? And what was your mother’s name? Two beautiful names John!! I had a “Tante Therese”!! Joyeuex Paques !! It’s been far too long since I had the pleasure of sitting at your kitchen table talking and watching you cook – and what a perfect, simple meal you’ve prepared for us tonight (well, it’s this morning here actually, but I felt it was last night, while I was reading). Easter greetings to you and the family – I wonder what you’re cooking for lunch today? Well, you’ve certainly been missed but you’ve got so much on your plate right now. Thank you for choosing to spend some of your valuable time here. Buona notte, BAM! Yes, I have burned — and even set on fire — enough food under a broiler to know better than to leave the kitchen while something is in there. I think I’d cry if I saw my halibut fillets on fire. I hope you and your family shared a very happy Easter, BAM. Happy Easter! I hope you have a delicious weekend full of family and good food! Thank you so much. I hope you and your family are enjoying a wonderful Easter, too! ChgoJohn, good for you using every last bit of mushroom for fish and stock. Waste not, want not. Your halibut is a strange fellow, what with its eyes relocating. Thanks, Kathleen. Incredible as it is, most flatfish follow the same maturation process, with one eye traveling like that. And we think our teen years our tough! It appears that you’ve used ham as a drink garnish. I knew you were a genius. Anyway, love the recipe and the mushroom mix. Really enjoying your Lent dishes. Thanks, Greg. I feel the same about your Sunday Supper series. They not only show you skill at menu planning but they draw our attention to some of your older posts. Now, that’s genius. I hope you and Katherine are having a wonderful Easter. I’ve loved your seafood entries. This one I think is my favorite. It was a surprise to see mushrooms with it and when I showed my daughter it, she agreed it was a good one. She loves mushrooms, so she will be making this dish for us. So you see you now have a new student. Every Wednesday I will email your blog post to her. That’s such a nice thing to say, Francine. Thank you and I hope your daughter makes the dish and you all enjoy it. Hi John! LOVE the halibut. I do like halibut a lot and you have it prepared so simply, I love it. I never think to pair mushrooms with fish, but I don’t see why not….they look so good here. I can’t wait for the farmers markets to start up this summer, we have a great little stall that sells exotic mushrooms that are to die for, they would be perfect for this dish. If you do make this dish, please come back here to tell us what mushrooms you used. I’d love to find out. I’m into fish and veggies lately and this yummy delight will be in my top list! Thank you for the vote of confidence. Halibut is such a a wonderfully flavored fish. I hope you find it as enjoyable as I do. The splurge on a good halibut fillet once in awhile is worth every penny. Looks like a great recipe to enjoy it with. I agree with you. Halibut is too tasty to go without. I’ll just enjoy it on special occasions, that’s all. Thanks and I’m glad you enjoyed the post. Buona Pasqua, a little late 🙂 My fish recipe file overfloweth! One better than the next. Halibut tomorrow night, THX! I hope you enjoy the halibut as much as we all do. Good luck! Also, I’m crazy about mushrooms right now… this sounds deeeelicious! Yes, I have the app on my phone and tablet. I won’t buy any fish until I check it out. Thanks just the same. I’m sure others will read your comment and benefit. Thank you. This is a great dish and any leftover mushrooms can be used in a number of ways. I love when that happens.